A man who says he is the renegade Afghan soldier who killed three British troops in Helmand province in Afghanistan has contacted the BBC. The man said he had been angry at the conduct of British troops and that he had acted alone. He said he had joined the Taliban after the attack. 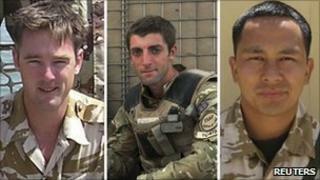 The three members of the Royal Gurkha Rifles died in a gun and rocket-propelled grenade attack on Tuesday. The UK Ministry of Defence said it was aware of the man's claims. The three British soldiers - Maj James Joshua Bowman, from Wiltshire, England; Lt Neal Turkington, from Craigavon Northern Ireland; and Cpl Arjun Purja Pun, from Nepal - died on Tuesday. On Thursday - 48 hours after the attack - the BBC's Kabul bureau was contacted by the Taliban and I was given a mobile phone number to call. An intermediary then passed the phone to a man, who said he was 21-year-old Talib Hussain from the central Ghazni province of Afghanistan. During the interview, which lasted about 10 minutes, he told me he was angry at the conduct of British troops in Helmand province. He accused them of killing civilians, including children. When I challenged him that civilians had been killed in Taliban attacks too, he said that the Taliban were Mujahideen fighting for their own country. He also said that British soldiers were not there to secure and reconstruct Afghanistan. The man told me that he belonged to the Hazara ethnic group and had spent a couple of years in Iran. He told me that soon after returning to Afghanistan a year ago, he had joined the Afghan army. Most of the Taliban support comes from the majority Pashto population. He said the shooting of British soldiers was his own idea, and that he had had no contact with the Taliban, Iran or Pakistan beforehand. It was only after the shooting that he had joined the Taliban. We cannot be certain that the man was Talib Hussain but I questioned him about his name, age, ethnicity, home village and the duration of his military service. I then checked the information with an official in Helmand. All of it matched. The Taliban had already said that they were sheltering the renegade soldier who shot the British troops at a base in Helmand province. Responding to the claims in a statement, the UK's Ministry of Defence told the BBC: "We are aware that an individual has contacted the media claiming responsibility for the killing of three British soldiers on Tuesday morning in Helmand Province. "While we cannot comment on the legitimacy of this individual's claims to be the suspect responsible for this cowardly attack, it is ridiculous to suggest that we are engaged in suicide attacks or are deliberately killing civilians. "Insurgents and those who are against the coalition mission in Afghanistan routinely make false and exaggerated claims and so care must be taken not to accept their accounts at face value."